Paula O. Jakobi, a New Yorker, was an active suffragist and playwright. 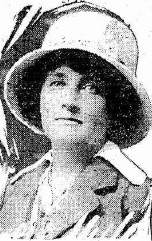 Paula Owen married Leo C. Jakobi, a manufacturer. They had two daughters, Audrey and Ruth. In 1904, Paula O. Jakobi was widowed after a long separation, when Leo died by suicide. She was active in the suffrage movement in New York City, where she wrote plays, including one about the Silent Sentinels who picketed the White House. Well-connected in the literary field, in 1914 she organized an “Authors Evening” where authors gave readings and books were auctioned. In attendance were Lincoln Steffens, Zona Gale, Edna Ferber and many other pro-suffrage authors. She also studied prison reform at the Massachusetts women’s reformatory in Framingham, and wrote about destitute women. For three years she was the opera critic for a New York newspaper. She was a member of Heterodoxy, a Greenwich Village feminist discussion and debate group. With its founder, Jakobi wrote a satirical one-act play, “Telling the Truth at the White House” (1917), based on suffrage protests in Washington D. C., not knowing that she would later be among those arrested. Her arrest came in 1917 when she was among the 41 pickets who protested the imprisonment of Alice Paul. On November 10, 1917, she was in the first of five groups of banner-carrying suffragists who went the White House. They were arrested immediately. Tried on November 12 and when released pending judicial decision, promptly went back to the picket line later that same day. Arrested and tried again on November 14, she and the other suffragists were sentenced from 30 to 60 days at the notorious Occoquan Workhouse at the D.C. Prison complex in Lorton, Va. There she experienced the “Night of Terror” and her vivid account of the experience provides many of the details we know about that horrible night. When they arrived at the Occoquan Workhouse, the women waited for Superintendent Whittaker to arrive to demand to be treated as political prisoners. But when he showed up, the women were attacked, beaten and dragged to a distant building. She writes that Dorothy Day’s arm was through the arm of Jakobi’s handbag, and the male guards pulled them in opposite directions until the string of the bag broke. Two men then dragged Jakobi away. Dorothy Day’s back was smashed over the back of a chair. When she cried out to Jakobi for help, Jakobi could do nothing as she was in the tight grip of the two men. All of the suffragists were eventually released by a writ of habeas corpus in late November, 1917. Mary Chapman and Angela Mills, eds., Treacherous Texts: U. S. Suffrage Literature 1846-1946 (Rutgers University Press 2011): 275. ISBN 0813549590. Inez Haynes Irwin, The Story of the National Woman’s Party (New York, NY: Harcourt, Brace, and Company, 1921).